We've started experiencing an interesting twist in the boat selling market. Dyna-Ski buyers are keeping their old motors and putting them on new Dyna-Ski Boats. Ski Teams started doing this several years ago and now it seems to have caught on with recreational skiers as well. It can greatly reduce the expense of getting a new boat since the engine is already owned and most likely paid for. Some buyers even keep their older trailers. In most cases the old boat is tired or needs some major repairs but the motor is still strong. Many of the buyers have replaced their older motor in the recent past and some have rebuilt their older motors. The end desire is the same as they want to keep the motor and get a new Dyna-Ski Boat. Sometimes customers have the motor swap done by their local dealer and sometimes we do the swapping. One time the new boat gets all new controls and gauges with the older engine and then again sometimes they keep all the original rigging. Each boat is different it seems. We always suggest new throttle and shift cables. Most the new Dyna-Ski Boat owners want new hydraulic steering as many older boats did not have it. So the new Dyna-Ski is easier to drive and safer with nothing to wear out or need replacing with the steering system. Another benefit is if down the road their motor needs replacement they have a newer boat to put it on. So once again the expense is spread out over many years. Most of the time only minimal updating of the controls and rigging should be needed unless you change the brand of outboard motor of course. I have never heard of an inboard boat owner keeping the motor and getting a new boat but I could be wrong perhaps? I got this off the Evinrude Website and thought it was interesting. Your Outboard Motor & most others HAVE TO BE amazingly tough engines. THAT CAR WOULD HAVE TO BE DRIVING UP A 30 DEGREE INCLINE AT 80MPH WHILE PULLING A BOAT! 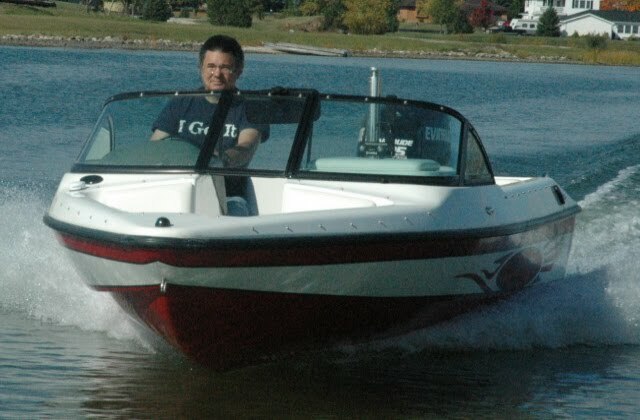 I wonder how the hours on an inboard water ski boat motor compare to the hours or miles of use in a car or truck? I'd guess the hours are harder since the motor RPM's is higher skiing than going down the road.